The sequel to Gnomeo and Juliet is available to own on Blu-ray combo pack and DVD on June 12th. 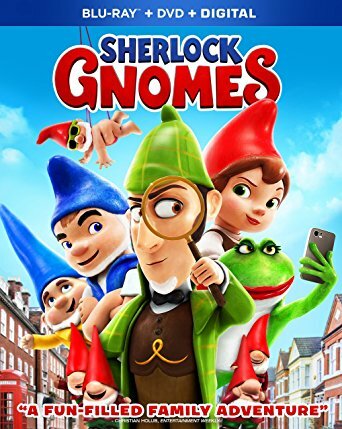 When Gnomeo and Juliet’s friends and family are missing, only Sherlock Gnomes can solve the case and return the Gnomes to the safety of their Garden. Johnny Depp stars at the Detective Sherlock Gnomes, from the Director of Kung Fu Panda. The film includes new music from Elton John , Bernie Taupin and Mary J. Blige. The Montagues and Capulets are now one big happy family. They have all been packed in bubble wrap and have made the move to their new home in London. Gnomeo (James McAvoy) and Juliet (Emily Blunt) have been put in charge of the new garden, which needs a lot of work. Before they can even put together a plan, their friends and family disappear. Sherlock Gnomes (Johnny Depp) and Dr. Watson (Chiwetel Ejiofor) have been investigating similar cases. Sherlock promises to locate the Gnomes and reunite Gnomeo and Juliet with their families. 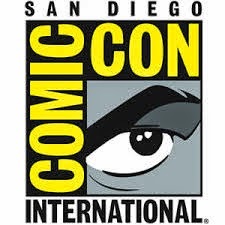 There is more than one evil villain standing in the way and a few surprises that even Sherlock Holmes won’t see coming. If you’re familiar with the story of Sherlock Homes you’ll recognize the characters Irene (Mary J. Blige) and Moriarty (Jamie Demetriou). For kids that have never heard of Sherlock they’ll be able to follow the story as well. All they really need to understand is that Sherlock is the good guy detective and Moriarty is the bad guy and that is easy to see. The film works for all ages. The Gnomes are still cute and silly. Although they are in real danger, the peril shouldn’t be too scary for the little ones. The film has a PG rating for some rude and suggestive humor. Sherlock Gnomes has an all-star supporting cast which includes Maggie Smith, Michael Caine, Stephen Merchant, Ozzy Osbourne, and Ashley Jensen. It has a fun list of extras with a drawing tutorial. As the summer vacation approaches, this is a good way to keep the elementary school aged crowd busy when they are indoors. The Sherlock Gnomes Blu-ray is presented in 1080p high definition making good use of the color palette. The brighter cheery colors certainly pop off the screen but it’s the wear and tear on the weathered paint of the chipped gnomes that makes it feel realistic. The imperfections are what gives the film its authenticity. Fine detail in Sherlock’s clothing is also apparent. Darker scenes inside the sewer look great. Sherlock Gnomes’ 7.1 DTS-HD Master Audio mix performs very well. Although not a musical, the film has a strong soundtrack. “Stronger Than I Ever Was” is a big number from Mary J. Blige who has a very powerful voice. If you have the right sound system you can definitely feel the bass with this song. Dialogue is equally important in the film and is intelligible in all accents, spoken softly or shouted. The Blu-ray includes 5.1 Dolby Audio in Dutch, French Canadian, French Parisian, German, Italian, Portuguese, Castilian Spanish, Latin American Spanish, as well as English Audio Description and English, English SDH, Dutch, French, Canadian, French Parisian, German, Italian, Portuguese, Castilian Spanish and Latin American Spanish subtitles. Gnome Is Where the Heart Is (7:01) – See cast and crew interviews with recording booth footage in this basic introductory featurette. Includes Johnny Depp’s explanation of which Sherlock Homes he modeled his character after. All Roads Lead to Gnome (3:11) – All the London locations that the Gnomes visit in the film are highlighted including the Tower Bridge and the Natural History Museum. If you have a visit to London planned you might get a few pointers here on what to see. Gnome Wasn’t Built in a Day: The Design and Art of Sherlock Gnomes (5:59) – This featurette focuses on the look and feel of Sherlock and the villain Moriarty with special attention to how the characters developed. See the original idea for Moriarty the ice cream mascot. 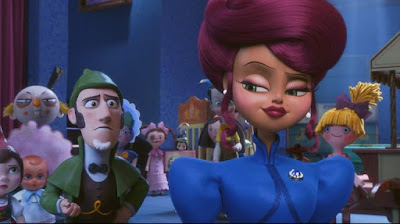 Miss Gnomer: Mary J. Blige and the Music of Sherlock Gnomes (4:10) – Although this isn’t a musical comedy like the first film, music still plays an important role and the film includes 3 new songs. Stronger Than I Ever Was (4:06) – Mary J. Blige’s big number with clips from the film. How to Draw – Follow along with these tutorials and learn to draw each character with instruction by Head Character Designer Gary Dunn. Animating Sherlock Gnomes (1:37) – A quick walk through the five stages of animation that bring a film to life. 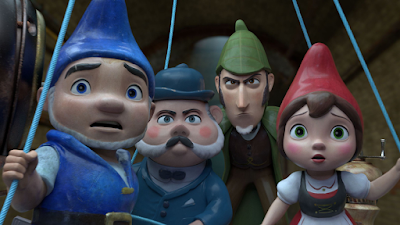 Gnomeo and Juliet was the superior Gnome movie, partially because it gets so much credit for having the cute gnome running around in the mankini. 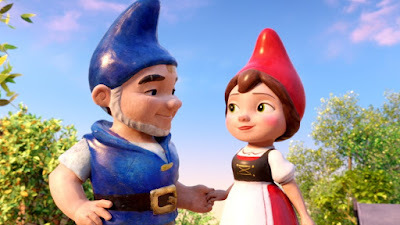 In Gnomeo and Juliet you got to know each Gnome and their personalities. In this film it’s mostly just Gnomeo and Juliet (from the garden) and they are fighting most of the time. As a sequel to the other film it’s a nice adventure. As a standalone, you might be disappointed. I would recommend watching the two films together. 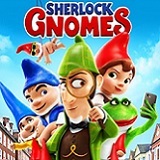 This film does introduce Sherlock Gnomes and Dr. Watson to kids who may not be familiar and it has some other characters than Holmes fans will appreciate. It’s cute, it’s colorful and as a parent, I’ve been asked to sit through far worse. This is one I didn’t mind watching and would even watch again, and that’s pretty high praise when it comes to an animated family film. Some of them are downright torture. The audio and video quality are above average and the supplemental features are worthwhile. Recommended.